In Nile Street, formerly belonging to Charles G. Baker, the Sylvester Pottery passed by purchase in 1876 to the firm of Holmes, Plant & Madew who, in addition to ironstone china and porcelain, produced door-furniture and brass founders’ sundries in china. The mark is the initials "H. P. & M." Messrs. Holmes, Plant & Madew were succeeded in 1886 by Holmes & Plant (also listed as Holmes, Plant & Co.). The works were subsequently made part of Doulton’s Nile Street factory." 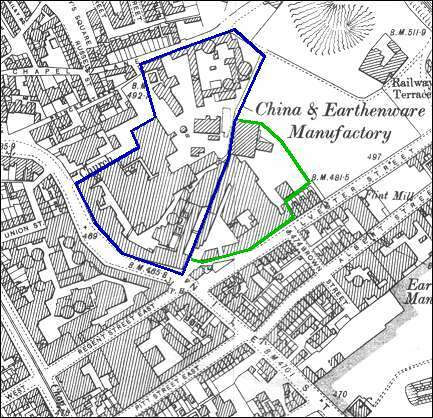 Works marked in blue are those of Doulton & Co.